Do I dare revive our FFC Burger Wars? Remember the ghosts of burgers past – Brazenhead & Five Guys Burger and Fries, Sammy’s Gourmet Burgers, & Zip’s Cafe? 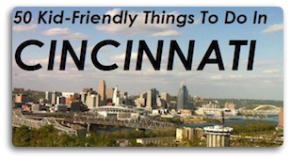 Once again, Groupon Cincinnati, came through for me when I purchased a great deal for Smashburger (deal no longer available). I thought spending $6 for $12 worth of food was a no brainer and I was also in the mood for a burger. So with Groupon in hand, kids at their grandparents, and husband in tow, we were ready to enjoy a dinner out for two. There’s no need for a romantic candlelight dinner when a big juicy burger is calling your name. Chris and I pulled up to the Smashbuger in West Chester and got a little bit starstruck when we saw the large menu on the wall. What do we order? There were so many burger options and add ons plus they also had chicken sandwiches, salads and sides. You also had lots of choices for free sauces and toppings (jalapeno, spicy chipotle mayo, red onion, kosher pickles, sweet relish and many more). After going into a bit of a salivating trance, I refocused and went with my original plan – get a burger! 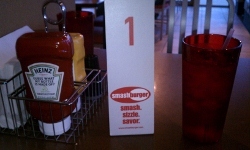 Smashburger is part of a national chain of restaurants and follows many of the other newer burger joints, you walk up to the counter, place your order then get a number for your table. The servers will bring your food to your table when it’s ready. Drinks are self serve but they do have a basket of condiments with napkins (you’ll need a lot of these) at each table. They also serve milkshakes made with Haggen-Dazs ice cream ($3.99). You have lots of options when ordering so be prepared and read the menu in advance – there are 3 bun choices, and lots of yummy and unique ad ons – avocado, fried egg, guacamole, and more. While we waited for our food, I kept having food envy as I saw lots of deliciousness coming out of the kitchen. Did I make the wrong call? Should I have gone with the Avocado Chicken Club ($$6.99)? The Harvest Salad ($5.99) ????? I think not. Food envy be gone – when my order arrived I was one happy camper. I ordered the All American Smashburger ($4.99) with a side of fried pickles ($2.29). 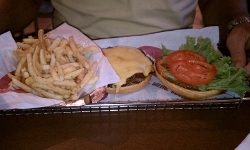 Chris also ordered the All American Smashburger with a side of Smashfries ($1.99). Next time, I’m going to try the Veggie Frites (“flash-fried asparagus speers, carrot sticks and green beans” – $2.99). We really enjoyed our burgers. The bun was lightly toasted and the burger was cooked just right with delicious tomatoes and crisp lettuce. My fried pickles were very tasty but I was more impressed with the thin cut fries – they were cooked with roesmary, olive oil and garlic. I wish they had a combo side of 1/2 fried pickles and 1/2 fries since I think an order of fried pickles for one is a bit too much. Actually a 1/2 combo order of any of the sides would be a cool option (hint, hint). I did see lots of families enjoying Smashburger. Even though the kids weren’t with us, I did have to check out their kids’ meals. They are $3.99 and you have a choice of hot dog, Smashburger, grilled cheese, or chicken strips. They are served with a side of fries and drink (milk is an option). We will definitely return to Smashburger. We’d love to hear about your “go to” place for a burger so please leave a comment and tell us some more great places to dine. My family and I love Smashburger. The Avocado Chicken Club is my personal favorite. Yum – I tried that one on my last visit and it was da-bomb!